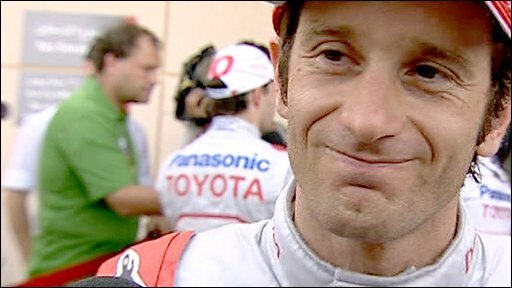 Jarno Trulli will start on pole in Bahrain with Timo Glock next to him as Toyota brilliantly locked out the front row for the first time in Formula 1. Red Bull's Chinese Grand Prix winner Sebastian Vettel came through in third but team-mate Mark Webber was controversially knocked out early on. The British pair of Brawn GP's Jenson Button and McLaren's Lewis Hamilton start in fourth and fifth respectively. Embattled Ferrari showed improvement and are eighth and 10th on the grid. Angry Webber was the biggest casualty of a dramatic qualifying session, finishing down in 19th after being blocked during a pacey lap late on by Force India's Adrian Sutil in the first knockout phase. "It doesn't matter if I protest," the Australian told BBC Sport. "My race is screwed. "I don't usually get caught out in traffic but it was the worst corner [the last] to get nailed on. An absolute disaster." Sutil, who himself finished in 16th but has been handed a three-place grid penalty, admitted his mistake afterwards. "It was a tricky incident," he said. "I saw Webber in my mirrors but I thought also he was on an out lap so I defended my position. "There was a big confusion, I just didn't know what to do. 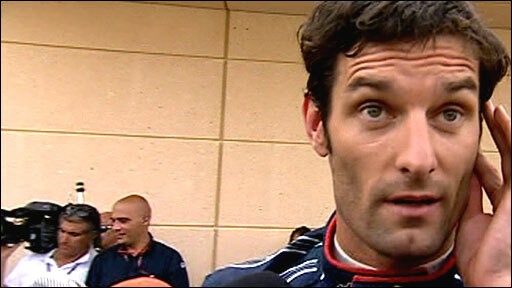 I will go and apologise [to Webber] now." Though they have been increasingly impressive since the first race in Australia, Toyota's achievement marks another surprise twist in an already-riveting season which some feared may be dominated by Brawn after Button romped to victory in the first two GPs of 2009. But Red Bull's historic one-two finish in Shanghai showed their growing strength - and Toyota, who made their F1 debut in 2002, are now flexing their muscles as they bid to become another team blocking out the traditional powerhouses of Ferrari and McLaren. Trulli came through in one minute 33.431 seconds, with Glock less than three tenths of a second behind him as track temperatures hit 50C. "This is a great result for the team," said Italy's Trulli after grabbing his first pole since the United States GP in 2005. "It wasn't an easy qualifying. After the first run we found a couple of troubles with my car. "But I didn't give up because I knew I had a good car and could fight for pole. I lost a couple of tenths on all my runs, so I think there is more potential in the car. "I was more comfortable with the car on race fuel and I am confident for the race because of my race pace." "We have worked very hard for this, and I'm very happy." Toyota have never won a GP and president John Howett stressed that the Japanese team were using a using a "fairly aggressive" strategy in order to break that deadlock on Sunday. "The car has been quick all season and between the top three teams it's very close," he said. "We were pushing to be on the front two rows because of the tyre situations. If it's hot, the soft tyre is quite difficult to manage so we need some free air if we are going to use it." World champion Hamilton's fifth place is his highest on the grid so far this season and indicates that he and McLaren are getting their act together after a stuttering start to the season. Button admitted that Brawn, for whom Rubens Barrichello starts in sixth, do not possess the pace of the cars which finished ahead of them over one lap - but insisted the championship leaders would be able to threaten during the race if conditions remained hot and dry. With Massa starting eighth and Raikkonen 10th, reigning constructors' champions Ferrari have given themselves a chance of getting a point as the Italian team seeks to avoid its worst ever start to an F1 season. BMW Sauber's slump continued as Robert Kubica - who twice had flames licking at the back of his car during qualifying as he sat in his pit box - finishing 13th with team-mate Nick Heidfeld just behind him. 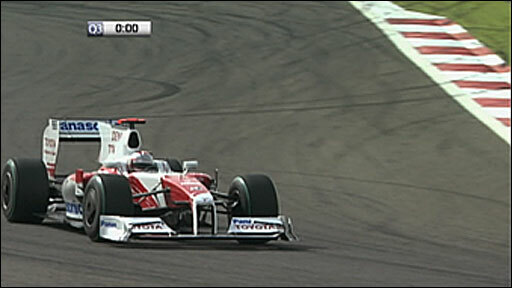 Kubica was on pole for last year's Bahrain GP in which the two drivers finished third and fourth respectively. "We are just too slow, but we knew that already," said Kubica. "We are lucky we have got Kers [Kinetic Energy Recovery System] here in Bahrain or we would be even worse. "We just have to stay cool and wait for Barcelona where we will have a new package."